We love playing around with fractions and my daughter enjoys making folding aids so I thought we would try to combine the two. As we have already used the Twinkl Circle Fractions in our paper plate fractions (which the kids have used A LOT) I thought we would try the rectangle fraction pieces this time. The Rectangle Fractions set is part of the paid for Twinkl Classic account. The set includes everything from 1 whole all the way to tenths. For this activity we cut out all the fractions pieces and we used one-half, one-third and one-fifth as our starting points. She started off with one-half and added two-quarters on top and then three-sixths. Each time she added the fraction on top she only glued the side edge so that each new fraction piece could flap over to reveal the fractions underneath it. By using these rectangular fraction pieces the kids have a built-in check. They can see that one-third will not fit on the one-half piece (there will be sections of the one-half fraction piece sticking out). For kids who are still getting used to equivalent fractions this is helpful as they can figure out for themselves which fractions match the one-half rectangle piece underneath. She continued adding to the one-half page until she had an Equivalent fraction folding aid which included 1/2, 2/4, 3/6, 4/8 and 5/10. She then moved onto doing the same activity but this time using one-third as her starting point. She ended up making this one slightly differently. The two-sixths pieces were glued on either edge of the one-third piece so that they flap open and then the ninth pieces were all glued on the one-side. It was just the way she fitted the pieces together. And then onto fifths. This one was the easiest as the only equivalent fractions that we had with the cut-outs where the two-tenths. I really liked this activity. It was very easy to put together. Just print out the rectangle fraction pieces, cut them and get the kids to play around and figure out what the equivalent fraction is based on what fits on top of the underlying fraction (the one-half, one-third and one-fifth). 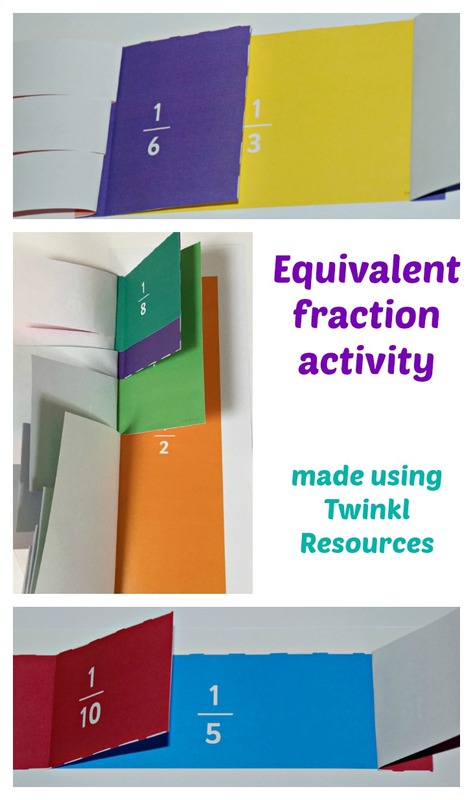 This entry was posted in Home education resources and tagged equivalent fractions, home ed, home education, homeschooling, kids fractions, maths activity, Twinkl. Bookmark the permalink.